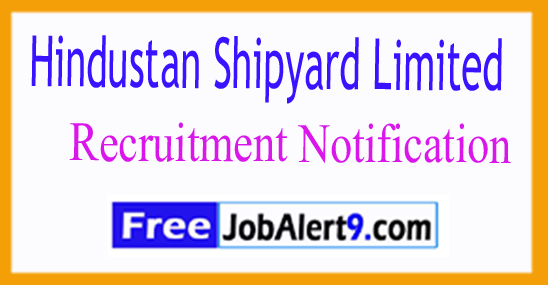 Hindustan Shipyard Limited (HSL) Issued For Recruiting fifty two Manager, Contract Engineer.All Eligible and Willing candidates Can Check Detailed Advertisement From Their Official Website And Apply Online On Or Before thirty first July 2017.Eligible and Interested Candidates Can Check Detailed Information For Each Postion Such As - Eligibility Criteria, Qualifications, Age Limit, Selection Procedure Before Applying. All Candidates Maximum Age Must No Longer Exceed 48Years (Post 1), 30 Years (Post 2), 55 Years (Post 3). INR Rs. 32,900 –58,000/- (Post 1), Rs. 20600 – 46,500/- (Post 2), Rs. 40,000 – 50,000/- (Post 3). All Candidates Must Pass Graduation Degree, Diploma in Mechanical/Electrical/Electronics Engineering, Graduate Degree, PG Degree or its Equal qualification from A recognized Board / University. General Manager (HR), Hindustan Shipyard Ltd., Gandhigram (PO), Visakhapatnam – 530 0.5 . Last Date for Online Application Form Is-31-07-2017. Click Here For HSL Recruitment 2017 Advertisement.